To satisfy all customer requests by pooling the intelligence of experts in our wide-ranging business areas - that is the strength of Sanki Engineering, namely, total engineering competency. Founded in 1925 - we introduce to you the approx. 90-year history of Sanki Engineering along with trends in Japan, the growing and turbulent times. 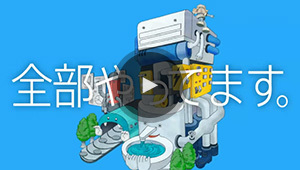 The corporate CM of Sanki Engineering can be viewed on video.